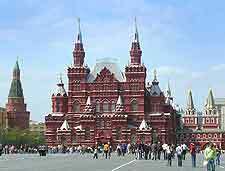 With a total of more than 50 different museums in Moscow, visitors will be able to see everything from ancient jewellery and coins, to fishing, aviation and even feline exhibits at the Moscow Cat Museum (Moskovskii Muzei Koshki). Many tourists choose to visit the Memorial Museum of Cosmonautics (Memorial'nyi Muzei Kosmonavtiki), which is located on Prospekt Mira on the northern side of Moscow and features historic satellites and even a moon buggy. For others, the Armed Forces Museum (Muzei Vooruzhenykh Sil) is a must-see, celebrating the strength of Russia as a leading military power and boasting in excess of 800,000 military related artefacts. 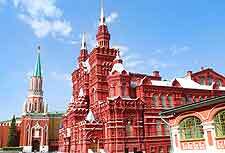 To learn a little more about Moscow's interesting past, the popular Moscow City History Museum (Muzei Istorii Goroda Moskvy) has built up an interesting collection of memorabilia and was established in the late 19th century. The Museum of Modern Russian History (Muzei Sovremennoi Istorii Rossii) on the Ulitsa Tverskaia is also on a similar theme and remembers prominent Russian figures, such as Stalin and the Bolsheviks. Moscow's Vernadsky State Geological Museum (Gosudarstvennyi Geologicheskii Muzei imeni Vernadskogo) is actually one of Russia's oldest museums are was founded in the mid-18th century. For a spot of natural history, the Zoology Museum of Moscow State University (Zoologicheskii Muzei MGU) is worth exploring, while for families, the many waxwork figures at the Otrazhenie Wax Museum (Otrazhenie Muzei Voskovykh Figur) always make for a fun trip. Favourites here include Mikhail Gorbachev and characters from Russian fairy tales, along with international celebrities and politicians.